Canyon Rubyspots, Hetaerina vulnerata, in Arizona are usually found along wooded canyon streams (Paulson 2009) and at elevations above 850 m (Bailowitz, personal communication). Several individuals were, however, recently observed at Spur Cross Conservation Area, Maricopa (elevation: 680 m; see 24 Oct. 2010 News item), the lowest elevation to date at which the species has been recorded in the state. 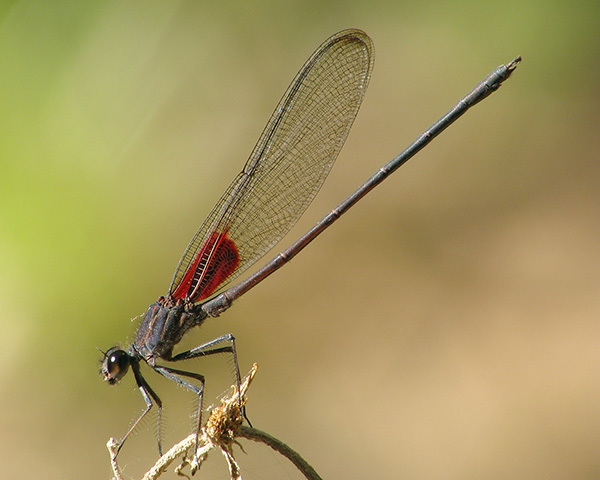 On 7 November 2010, at least three mature males were seen flying along Queen Creek at Apache Tears, Pinal (elevation: 767 m), thus indicating another location where the species is present at lower elevation than usual.